Umoya was born in the Kruger National Park and was one of the seven original elephants rescued from Swaziland in 2003. In 2007, Umoya gave birth to a female calf, Phakamile, and in 2010, gave birth to a male calf, Emanti, which brought the San Diego herd now up to 18 elephants in total. On the day Umoya died, San Diego zoo caretakers gave the herd time to mourn her death, something elephants, both in the wild and in captivity, are known to do. Umoya stood out in the San Diego herd as being one of the most dominant females and as being the only elephant in the exhibit who walked backwards. Since Umoya’s death, several animal rights groups have called for an investigation into the incident stating that it raises questions about the welfare and safety of elephants and other large mammals in zoos. The current call to action is spearheaded by In Defense of Animals (IDA). IDA has called on the US Department of Agriculture (USDA) to investigate the circumstances surrounding Umoya’s death. Specifically in their complaint, IDA states that an adult male elephant, Mabhulane, who was known to be aggressive, was confined with the female elephants and their young. IDA Campaign Director Catherine Doyle explained why this is significant by stating, “Zoos typically keep males and females separated because the powerful males can injure the females. In the wild, adult males do not live with the matriarchal family groups, and females are not known to kill one another.” (Zoo officials however have not released a statement yet indicating which elephant may have caused Umoya’s injuries.) Doyle further went on to explain, “This elephant’s shocking death is another tragic example of how elephants suffer in inadequate and artificial zoo exhibits. 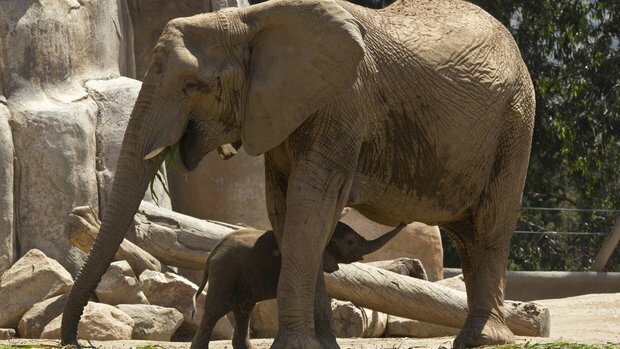 There is nothing natural about the San Diego Zoo Safari Park’s elephant exhibit or keeping 18 elephants crammed into a space of less than six acres when their natural home ranges can measure hundreds of square miles.” The IDA complaint further wants the USDA to investigate why no staff or security was aware of Umoya’s injuries until the trainers arrived in the morning. Ultimately, whether an investigation is launched is up to the USDA. On one hand, keeping animals that naturally range so wide in a space so small has always bothered me. On the other, animals settling things in a violent manner — in which even fatal wounds result — is perfectly natural activity. I’ve observed even doe deer, supposedly very docile creatures, get incredibly violent with one another over something as similarly trivial as a particular piece of forage — when plenty of food was available all around. The thing to perhaps remember here is to see past human sentimentality and projections. For example, male lions and bears routinely and deliberately kills cubs of their own kind. And as horrifying as that might seem to us, it’s simply the natural order of things for them. It keeps the species strong. Again, it is completely natural for one elephant to assault, injure or even kill another in some circumstances. Or, in other words, this is nothing that would not have happened in nature, regardless of the size of the animals’ living space. Now, that said, does it still justify shoe-horning elephants into a small space? Or, does it relieve the zoo staff from the liability of being able to see this coming, and taking steps to separate the particular animals in question? I agree, there is nothing natural about what The San Diego Wild Animal Park and other zoos are doing with elephants. Umoya’s tragic and preventable death is just the tip of the ice-berg when it comes to death and tragedy surrounding the elephants at this park. For the complete story check out the latest blog at http://www.vetunleashed.com. Are we ever going to admit that zoos, aquariums and other prisons for wild animals are dead wrong? Councillor LaBonge, I could care less about your ‘experiences’. And please, how about a 1000 year moratorium on the humbug about conservation. The only way a zoo can ‘educate’ is by provoking the disgust of conscientious patrons. Find the culprit soon …. or I hope so. Good day.